And here is the view from a close orbit of one of the 3 majors moons of the same planet...it do a whole orbit in a little less than 18 hours and it weight about 0.011 moon It is geologically active...the probes have spot many cracks letting out liquid and ice. On the left side, we see the biggest of the 3 majors moons. It weight about 0.36 moon and have a deep ocean under is frozen surface. Because of tidal heating it is believe that we have liquid water under is surface...it have about 20.4% of is mass as water. It orbit is mother planet in 2.64 days. It also have a dense atmosphere. Its also geologically active with many water-ices volcanoes. Is surface look 65% new. Names will come when i will have complete the whole system. My next project...a Binary Stars System. the main start is 1.23 Suns mass and the other one is about 0.247 sun. orbital distance 87.5...560 yrs for a whole orbit with an ecc of 0.17 9since we can't ply with the stars orbit for now...so it will be that ecc. I love the colors lovely! My epic black hole sun experiment that shut down my laptop for reasons not yet fully understood. Look! It's a KITTY CAT! Prometech, those videos are absolutely beautiful. Either it is a defect on our Space telescope, or the Life propability in this System is pretty high. it houses one of the biggest Gas-giant ever discovered. Some Alien Phanatics have speculised, that there was/is a intelligent civilisation in that system, wich has Terraformed many moons and planets. Note, that there are no rings in this Simulation, because of lag issues. How do you add an asteroid belt when looking from a zoomed out location? Thanks! look in the ring presets, asteroid belt should be an option. Sweet, thanks! working on my Favorite Fictional System, just taking forever to get everything just right, that and digging thru 80 years of source material to decide what to include and what not. Just go to chart and press any chart you like! Interesting are Radius and Mass. Here is a young solar system I made. This is my first successful attempt at making a system in US. It's nothing special, but I'm pretty happy with it nonetheless! My GIANT solar system. Explore it. Could you attach the simulation file so we can download it? I made a new system today, it's called the Clock System, it simulates time, unfortunately, a human object cannot orbit another human object in a very stable orbit (and therefore the orbital parameters won't work right, as that might be a bug), so I chose to make an Earth sized body as the main body, and the smaller bodies are cue balls (which are unfortunately not round enough and need improvement in the next update) orbiting the main body, which is named Clock. Each cue ball has a specific name and orbit duration, and unfortunately, due to the main body size and the distances of each smaller body (as well as orbital issues), the time step had to be increased to 100000 seconds/sec, so everything had to be increased by a factor of 100000, so everything is 100000 times longer, but it (and their small masses) does help make their orbits stable. I'll share this Binary star system. It's called The Panthallasia System. It consists of two massive stars, Panthallasia Majoris and Panthallasia Minoris. Each stars have its own planets, with each one having at least one habitable planet. I'm working on the Lylat System from the StarFox games. It's based on the new canon from SF Zero, and since not all of the well-known planets from past games were added, I'm taking some creative freedom with it. Katina - Swamp planet (semi-arid). Aquas - Ocean planet (scattered islands). Corneria - Temperate world; "Hub of Galactic Peace." Rhea (perihelion) - Mars-like planet with loads of nuclear isotopes and an underground biosphere. Rhea (aphelion) - High point in orbit. Slaga (perihelion) - A molten planet heated by nebulae and anomalous magnetism. Hosts metal-based life. Slaga (aphelion) - High point in orbit. Freo - Ice giant with cryogenic moon "Cryona," which hosts boron-based life. Sector Omega - Interdimensional rift hosting the asteroid Venom, home of the infamous Dr. Andross. Solran - Red dwarf companion star with more planets. Mysteria - A yellow dwarf, making Lylat a trinary system. Hosts even more planets. Tian - Planet with the characteristics of Eladard from the unreleased StarFox 2. Eladard - Named after a planet from the unreleased SF2; reimagined as temperate world similar to Corneria. Colossus - Gigantic semi-frozen world with scattered evergreen forests and swamps within volcanic regions. Shardria - The "glass planet." Cerinia - Reimagined as planet within Lylat System. Brimming with interdimensional energy. 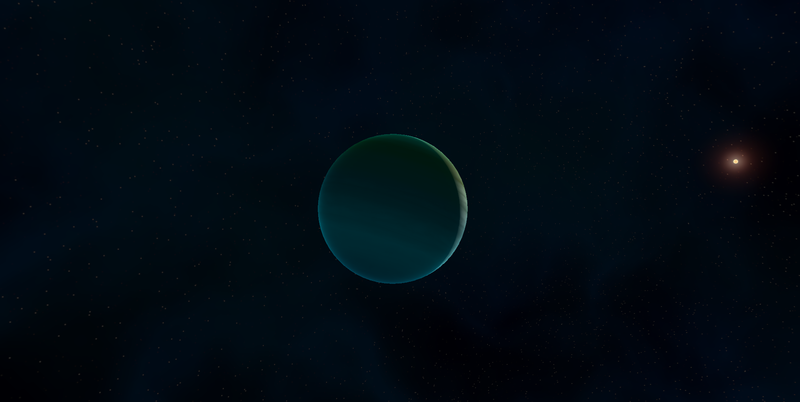 Animus - Habitable planet referenced in the original Dinosaur Planet before it was a StarFox game. Crimsona - Reddish gas giant. Sauria - "Dinosaur Planet." Made habitable by vast amounts of interdimensional energy. I haven't even gotten to most of the moons, dwarf planets, and other minor objects yet. I have a bad feeling that this thread is going to die out. Better make some more simulations. I'll finish that post i promised to post last year. Boy has my life taken a strange turn. I ended up forgetting to post it. The star is named "Blaitesia" and the planet is named "Gronerovv"
The planet, a gas giant with a mass of over 4 Jupiters, had an extremely eccentric orbit, this is due to the fact that the planet does not form from the star's protoplanetary disk, but from another star system. The planet somehow got ejected away, and cause is yet unknown.